Invoking a classic vision of comfort, your modern living room can be just as elegant as the classic parlors women used to entertain their house guests. The plushly cushioned armchair was thoughtfully constructed with Ultra Down seat cushions and Blend Down back cushions, ensuring the ideal amount of enveloping comfort and consistent support that your body needs. 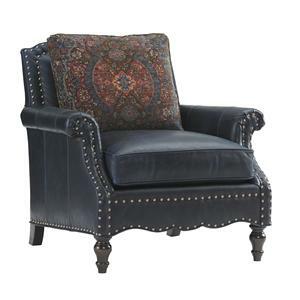 English arms and turned legs finish off the relaxed chair with an extra dose of timeless elegance. The Island Traditions Kent Wing Chair with English Arms by Tommy Bahama Home at Hudson's Furniture in the Tampa, St Petersburg, Orlando, Ormond Beach & Sarasota Florida area. Product availability may vary. Contact us for the most current availability on this product. Warranty Wood furniture is warranted against defect in materials and workmanship for one year. Upholstery is warranted for five years. Invoking a bygone era of sumptuous luxury, the Island Traditions collection features exquisite, dark-finished hardwoods, intricate hardware and carved detailing, and a splashy accent of indigenous materials. The British Colonial styling draws its inspiration from the era when Britain governed the West Indies. Antique furniture from this era has an exotic yet classic edge, shown in this collection by chests modeled after campaign trunks, crafted from dark mahogany. Hand-hewn tops and antique burnished brass hardware give an enticing, heirloom look to your craftsman-made furniture. This collection blossoms with unexpected details on every piece, from opulent lion's paw feet to woven rattan and Penn shell inlay. The sophisticated Island Traditions lifestyle can bring grandeur and history to any room with our stunning selection of finely crafted pieces for the bedroom, living room, dining room, and study. Pair these pieces with Island Traditions upholstered sofas and chairs, creating a casually elegant finish. An exotic, unforgettable twist on traditional living. The Island Traditions collection is a great option if you are looking for Traditional furniture in the Tampa, St Petersburg, Orlando, Ormond Beach & Sarasota Florida area. Browse other items in the Island Traditions collection from Hudson's Furniture in the Tampa, St Petersburg, Orlando, Ormond Beach & Sarasota Florida area.